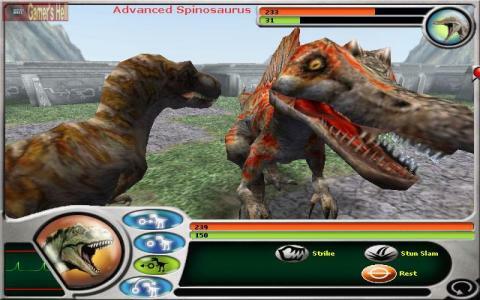 The classic movie based on Michael Crichton's book that featured dinosaurs running wild in the modern world has given host to a number of game adaptations, including Ocean's solid take in the unimaginatively titled Jurassic Park, to the dire shooter Trespasser and the intriguing RTS that is Chaos Island. This one is perhaps one of the more bizarre ideas, but it's still worth a look, if only for its sheer oddity. The story here revolves an explorer who's leading some kids on an adventure but who lands on the wrong island and finds himself and his wards on the infamous Isla Sorna, home to rampaging dinosaurs. You play the part of an agent sent in to rescue these hapless explorers but rather than head out into the jungle yourself, you're actually given a nifty piece of gadgetry which means you can control the various dinosaurs and use them to seek out the kids. Of course, the other dinosaurs aren't going to let you have things your own way, so expect to get into some fierce scraps, but fortunately you can upgrade your beast's DNA and give them some useful skills. Dinosaur Battles really is a strange beast of a game. It's definitely aimed at younger audiences, which is evident in its story and the way it's presented and in the controls and fighting system. 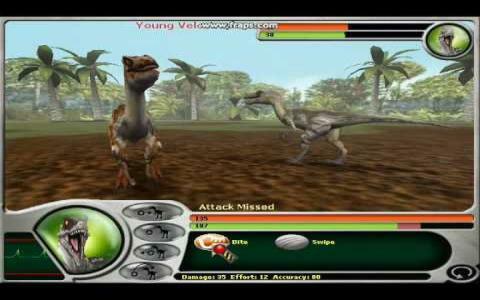 However, there's still a lot to do and there are plenty of environments to explore and dinos to meet while the fighting requires just the right amount of strategy to balance the action. The visuals are pretty slick too, so if you can find it, this makes for a good choice for any dinosaur fans in the house.